Country living just south of the city. Just south of Ottawa lies some beautiful neighbourhoods. Some have quite affordable homes in rural neighbourhoods within a short drive of the city. Others have gorgeous mansions available. Throughout the last eight years Greely has seen a 58.7% increase in the number of dwellings. 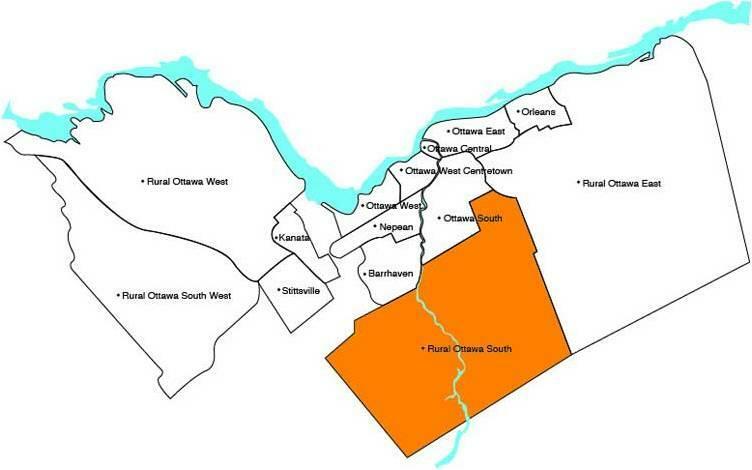 Greely’s increasingly rapid growth can be attributed to its rural atmosphere and easy access to Ottawa’s urban centre. Furthermore, Greely presently has several large areas of undeveloped land within its boundaries. Greely’s boundaries currently contain enough land for approximately twenty-two years of residential growth based on current development patterns. Popoulation 9,049. Oldest house: Built in 1800. Manotick is a community in Rideau-Goulbourn Ward in the rural south part of the City of Ottawa, Ontario, Canada. Population 4,486 in 2016. The population in the village rebounded as Manotick came to be viewed by some as a bedroom community for Ottawa, joining the City of Ottawa in 2001. Oldest house: Built in 1849. Kars is a village on the Rideau River within the rural section of the city of Ottawa, Ontario. Prior to joining the city in 2000 it was part of Rideau Township. Oldest house: Built in 1846. Metcalfe is a population centre located in Osgoode Ward, in the rural south-end of the city of Ottawa, Ontario, Canada. Prior to amalgamation in 2001, the community was in Osgoode Township. Population 1,763. Oldest house: Built in 1856.